Adding personal touches to your interior design is what makes a house a home and we think nothing does that quite as well as photography. Whether you are decorating a room from scratch or giving one a refresh, adding photos into your design can make all the difference. Since we know this is no easy feat, we’ve gathered some tips from design pros to help you stylishly incorporate photography into that room begging for a little TLC. If you like a classic space and nothing too busy, choose a small number of nearly identical images to feature. 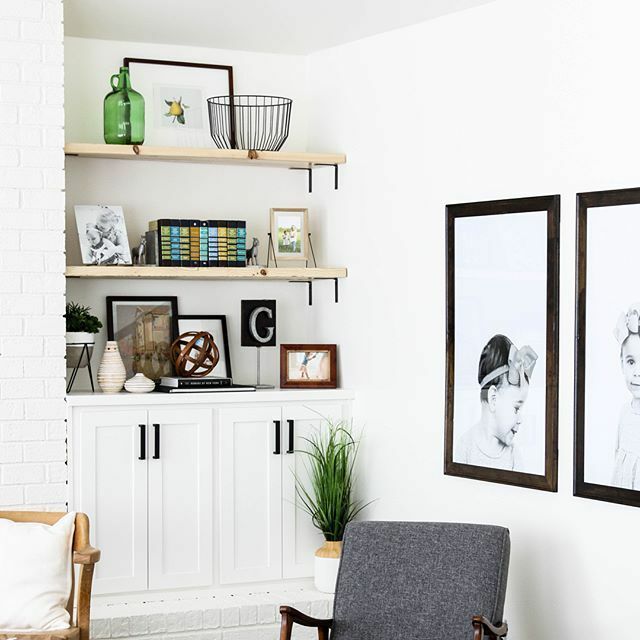 Our friend Danielle of @thehousegoat, stuck with black and white large format Prints of her little ones to dress up a big wall in her living space. The two images are shot in the same style making them flow together perfectly. She hung them in identical frames and used the white space in the shot to create a major contrast to the focus of the photos. When creating a feature wall, make sure to stick with a theme. 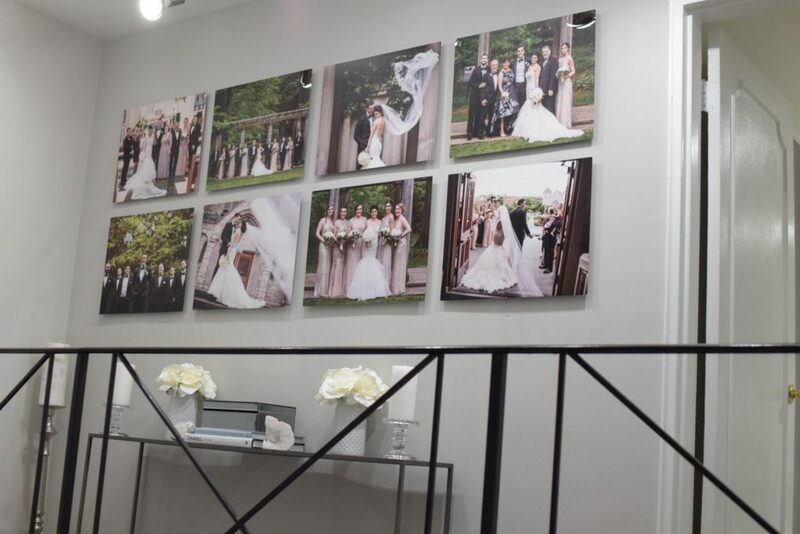 Monica of Monica Marie Design used her wedding as a theme for a gorgeous gallery wall in her home. Because she printed all of her images on 24×24 Metal Prints, she was able to create a cohesive, geometric well-styled gallery wall. The standoffs give her a contemporary edge and she has the memory of her favorite day hanging proudly in her home. Select images that have colors that match the aesthetic of your space. Bree of Baked Bree used all blue tones in her home which made the mixing of mediums and elements in her gallery wall flow perfectly. This is a great idea when working with a larger wall or open space. If you don’t want to fill your walls with photos add them into your home decor in a more subtle way. Incorporate your loved ones into your home by adding framed prints to shelf decor, consoles, or your coffee table. We love mixing in decor objects, greenery, and books to add some extra dimension. You can achieve this style so many ways and you can change out pieces to easily give yourself a room refresh! If you aren’t someone who typically adorns their walls with smiling faces but still want a personal touch, try hanging your favorite quote or a symbolic pattern. This can be unique to your family or your design aesthetic. 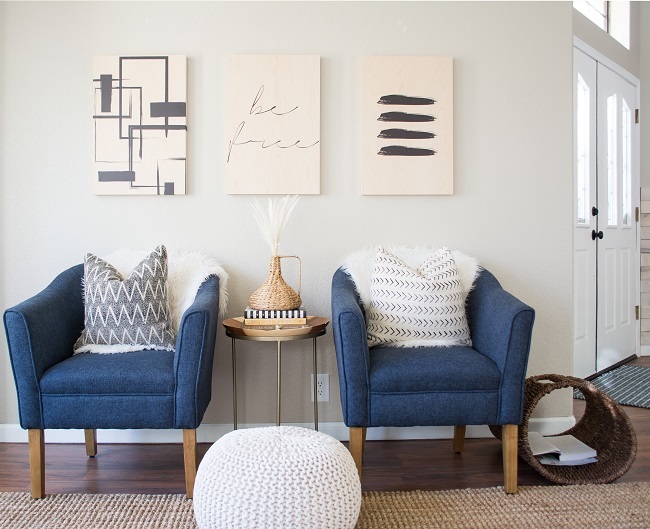 Christina of CG Home Interiors printed beautiful geometric patterns and a short quote on Wood Print Wraps to dress up the walls in her more formal living space. We love how this design stayed true to her home decor style but still added a personal touch! 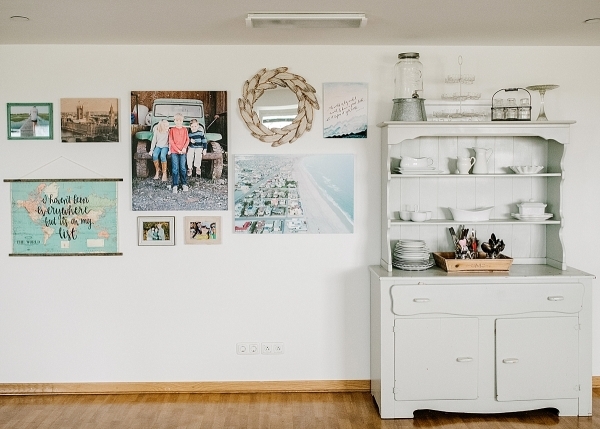 There are endless options when it comes to adding photos stylishly into your home! We love how photography can bring you back to the most special place in time and add so much love to your space. How have you incorporated photos into your home decor?